Holley EFI Harness Kit UNIVERSAL - MiataRoadster - Stay tuned with MiataRoadster! Take control of your engine with Holley EFI plug and play Harness kits. Tired of jumping through hoops and having to play tricks with the factory ECU? Welcome to the better way. Is your cam too wild for a MAF? No problem. Power adders? Bring ‘em on. We’ve got integral nitrous and boost control. Ready to rock and roll with the awesome new Coyote, Modular or LS? We’ve got what you need with plug and play kits. It has never been easier to make your engine swap do exactly what you want. Just add an ECU and WB02 sensor to make these a complete EFI System. 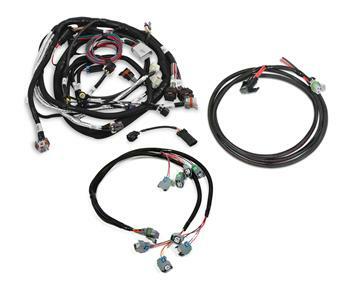 Holley now offers complete plug and play harness kits for our most popular engine swaps! Harness kits include the following: Application specific main engine harness, Injector harness and ignition harness (where required) along with an ECU power harness. Ford Modular and Coyote kits also include coil drivers for OEM coils.